International Women’s Day - 8 March - commemorates the struggles of women workers worldwide against low pay and exploitation. Special feature from The Socialist, paper of the Socialist Party, cwi in England and Wales. To mark International Women’s Day 2007 (8 March) The Socialist carries below three articles by Socialist Party members on some key social issues facing women today. These articles - on low pay, maternity services and trade union struggles - show that the fight for pay and jobs, decent welfare provision and social equality is still as relevant today as it was at the time of the first International Women’s Day celebration in 1911. It was in the USA in the latter part of the 19th century and the early 20th century that women workers, mainly engaged in the clothing and textile industries, staged strikes and protests against their working and living conditions under capitalism. In 1910 an international women’s conference was hosted by the Socialist International (the ’Second International’) which agreed to mark international women’s day on 8 March. On 8 March 1917 thousands of women textile workers in St Petersburg, Russia, walked out of their factories exasperated by the severe shortages of bread. These women marched to other factories and called on workers to join them on strike. As Leon Trotsky comments in his History of the Russian Revolution: "The slogan ’Bread!’ is crowded out or obscured by louder slogans: ’Down with autocracy!’ ’Down with the war!’ " - the Russian revolution of 1917 had begun. For the first time ever, British women now make up the majority of the workforce (51%). Apparently, we are breaking through the ’glass ceiling’ with more female politicians, newspaper editors and judges, etc, than before. We live in a ’post-feminist’ world. Or do we? High profile ’career women’, like New Labour politicians, are praised by the media because they can ’juggle it all’ - career, family, love life, etc. What is hidden are the (mainly female) paid cooks, nannies and cleaners that allow this new found ’equality’ by doing the ’dirty work’. A small layer of professional women may have broken through but the reality for the majority of working-class women is that over 30 years after the Equal Pay Act of 1974 the pay gap between women and men is increasing. In fact, even the breakthroughs for upper and middle class women ’at the top’ are limited. Women are still vastly under-represented in parliament, as newspaper editors, company directors and judges etc. For example, only 26% of the most senior civil service managers are women. Yet the overwhelming majority in civil service clerical grades are women. However, the other side to this is that female trade unionists in public sector unions like PCS and UNISON are increasingly important to the developing class struggles in Britain. Low pay is a major issue for everyone but women are most vulnerable as they tend to be concentrated in low paid, often part-time and ’gender segregated jobs’ like catering, cleaning and caring. Society devalues these jobs as they are still seen as ’women’s work’ and reflect women’s ’traditional’ role in the household. Social surveys show that most people now agree that men and women should share childcare and cleaning chores equally. However, this is often not what happens in practice. Women still tend to take on most caring responsibilities (so are worst affected by NHS and social services cuts). This is why so many women prefer to work part-time while at the same time there are very limited opportunities for men who want to take paternity leave, etc. Changes in the British economy over the last 30 years mean that more women work than ever before. The decimation of manufacturing has seen the erosion of well-paid industry jobs in traditionally male dominated industries. One-fifth of full-time workers are now low paid despite the introduction of the minimum wage. The greed and short-sightedness of British capitalism has meant that it is no longer possible for most families to survive on only one wage. Meanwhile the part-time pay gaps remain high at 38% while the EOC (Equal Opportunities Commission) shows that four out of five part-time workers (many of whom are women) are working in jobs below their potential. The EOC concludes that this is at least partly due to the lack of flexible, high skill senior roles. Ethnic minority women are even more disadvantaged due to the racism of employers. The EOC reveals for example that 6% of Pakistani women and 9% of Black Caribbean women work as managers or senior officials compared to 11% of white women. In both the public and private sector, the lack of career progression for women is a big issue due to both direct and indirect discrimination. Research has also shown that having a university degree is no guarantee against unequal pay. One survey showed that even when they have the same degree, male graduates earn more than their female counterparts. Within the civil service unequal pay remains a big issue as elsewhere. Recently the civil service gender pay gap decreased but here is the catch: it was the result of thousands of low paid female civil service workers losing their jobs as a result of the government’s job cuts programme! This picture is depressing but there are reasons to be optimistic. Female workers can be the most oppressed but this gives them all the more reason to fight back. Recent industrial disputes like Gate Gourmet and care staff in Southampton and Yorkshire, which involved mainly women workers, give a glimpse of that potential. Meanwhile, in the civil service trade union, PCS, thousands upon thousands of female workers are linking up with their male colleagues and taking part in a national campaign to defend jobs, pay and services. PCS has a fighting left-wing national leadership that is prepared to mobilise its members and stand up to a government that has no answers for workers, regardless of gender. And although at this stage most trade union leaders are not prepared to lead a struggle, socialists can play an important role in the struggle to transform the unions into campaigning unions. 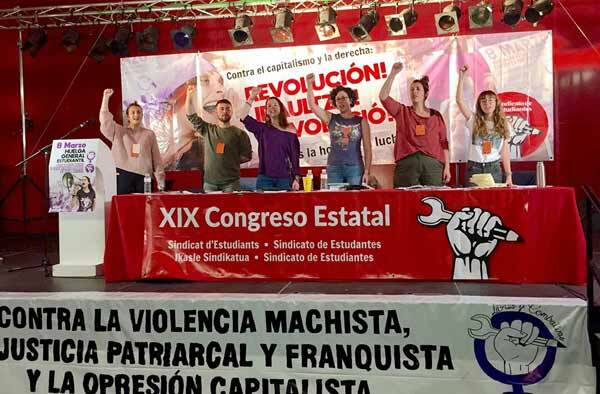 However, an integral part of this task is to ensure that socialists and trade unionists understand women’s oppression and why it’s vital to counter it in order to strengthen class unity in the face of the bosses’ attacks. This year, the 90th anniversary of the Russian revolution, on international women’s day, we can celebrate the critical and courageous role that women activists have played internationally in the fight to liberate not just themselves but the working class as a whole, a fight that continues today. In more recent times - during the Miners’ strike of 1984/85 in Britain - women fought to defend jobs and their communities, not only standing alongside the men on picket lines but organising and speaking at the rallies and meetings which kept the strike going. The summer of 2005 saw the brutal sacking of 670 airport catering workers, (many low-paid women) at Gate Gourmet. They were sacked by a megaphone announcement and then contained in a room as ’prisoners’, as management brought in unorganised migrant labour to do their jobs. The workers’ willingness to fightback was shown in the magnificent solidarity action by British Airways baggage handlers who walked out the next day but they were disgracefully betrayed by a cowardly trade union leadership that bowed down to anti-trade union laws. On 23 March last year over one million local government UNISON members, the majority low-paid women, showed their industrial strength by taking strike action in defence of their pensions. Public services were brought to a standstill only for the union leadership to call off further strike action in favour of talks. A full year later and the union has shown it is not prepared to stand up to New Labour and union members are expected to accept what can be salvaged from a mishandled dispute that they could have won. The left-led civil service trade union PCS union has called strike action on a number of occasions in the last year to defend jobs, terms and conditions and has shown itself to be brave enough to confront the government. Currently, careworkers - members of UNISON - are showing that low paid women workers are not prepared to be the silent victims of cuts, privatisation, bullying and harassment and are bravely fighting back. In Southampton, the council sent letters to over 200 careworkers over Christmas with the ultimatum that they could either sign new contracts on lower pay or find other jobs. There have now been four days of strike action and Southampton UNISON is balloting for council-wide strike action against pay cuts and privatisation. In Huddersfield, 16 women careworkers employed by Unique Care have been sacked after walking out in protest at the bullying and harassment which they refused to tolerate any longer. They are entering the ninth week of their dispute, demanding that Kirklees council take them back ’in house’ and end the contract with the profiteering private company and its 19th century employment practices. Thy are still strong and united in their fight for justice. As socialists, we send greetings of solidarity to women in every country where they are struggling against capitalism, the system that oppresses women and the whole of the working class. Everyday we are bombarded with media images of female models and celebrities who are mainly valued for their appearance. ’Glamour models’ like Jordan are sold as role models to young women. Many buy into the illusion that effectively selling your body and conforming to ridiculous ’beauty ideals’ is the only way to be rich or successful (in reality disguising the real degradation and exploitation of this fashion/glamour industry). Research shows that one in four women experience domestic violence in their lives. The fact that so many women are still economically dependent on men alongside the lack of social housing makes it much harder for women to leave violent relationships. Imagine you are in labour, contractions coming every three minutes. You arrive at hospital panting and trying to remember your birth plan, pay £2 to park, make your way to the right floor - to be told that the maternity ward is shut due to staff shortages and you will have to go to another hospital. It sounds like a bad comedy - but it is not so far-fetched as maternity units, particularly in London and eastern England, were shut temporarily for a total of 4,000 hours (the equivalent of 165 days) last year. Maybe the government could train more taxi drivers to deliver babies as women attempt to get to their next nearest hospital, several miles away, through heavy traffic! Thousands of women each year in the UK rely on the NHS during pregnancy and childbirth but it seems they are being badly let down. The Royal College of Midwives (RCM) concluded, after conducting a survey of UK midwifery services in December, that they are becoming the ’Cinderellas’ of the NHS, with more babies being born against a backdrop of cuts, job freezes, midwifery shortages and financial crises. The government claims there has been a 44% increase in students entering midwifery. So what has caused the current shortage? Money - or lack of it. NHS Trusts, desperate to balance their books have frozen vacancies in maternity units, cut staff and taken on cheaper maternity support workers. The government denies that their current ’reconfiguration’ of maternity services is driven by the need to cut costs. They say that the proposal to centralise services into fewer regional specialised hospitals and close many smaller maternity units across the country will improve services for mothers and babies. They say it will allow them to offer choice and continuity of care throughout pregnancy. The trouble is, nobody believes them! The RCM’s response was that there is ’no hope of this unless midwifery services are expanded’. There are currently 25,000 midwives in the UK and the RCM estimates that a further 10,000 are needed, but the government are silent on this. The response from the public and health service staff has been angry demonstrations against cuts and closure of maternity wards. Clearly they are not convinced by the ’clinical case for change’ which the government’s Children and Maternity Tsar, Dr Sheila Shribman, published last week to justify the cuts. Labour MPs in constituencies where cuts are most drastic are obviously feeling the heat. Never mind Tory MPs hi-jacking anti-cuts demos, these days you could be rubbing shoulders with a Cabinet minister! But the main parties are responsible for the current crisis in the NHS and maternity services in particular, and it is pure hypocrisy for them to pretend otherwise. Whilst some of the protesters, health workers and community activists opposing cuts still welcome support from ’rebel’ MPs, others have a healthy disrespect for all the establishment parties, and some of these are starting to draw the conclusion that they need an independent political voice. This could be an opportunity not only to build the campaign for a new workers’ party but to widen the debate from simply opposing cuts to what we really need and want from NHS maternity services and how we can get this. Dr Shribman’s report is cloaked in progressive language about giving women ’choice’ - more home births, midwife-based birthing centres, reducing unnecessary caesarean operations. Her words are a little ironic given that last year a quarter of existing birthing centres in England alone closed or were under constant threat of closure due to funding crises and a shortage of midwives (Guardian online). ’Choice’ is meaningless in the hands of this government, whether in relation to schools, housing or the NHS. Private maternity services are a growth industry as those who can afford to, pay £4,000 or more for the one-to-one care and environment during childbirth that should be available to all. To give women genuine choice, to provide services which are in the best interests of the mother and her baby would, as a start, require the 40% increase in midwives which the RCM refers to. But in addition we need to campaign for a massive increase in resources into an NHS that is genuinely accountable to its users and the local community. Two-thirds of Heads of Midwifery (HOM) said their units were understaffed. One-fifth said their Trust operated an ongoing recruitment freeze. Two-thirds of HOMs worked in Trusts that were in deficit 2005/06. Trusts employ fewer midwives now than a year ago - increasingly relying on lower paid maternity support workers. Trusts are slashing training budgets - in some cases altogether. A number of midwifery units are now wholly dependant on charitable donations to fund midwifery training. The Socialist Party is affiliated to the Committee for a Workers’ International (CWI) - a socialist international organisation campaigning in 40 countries worldwide. If you need childcare please contact us urgently.